This book examines how Irishness as national narrative is consistently understood ‘from a distance’. Irish Presidents, critics, and media initiatives focus on how Irishness is a global resource chiefly informed by the experiences of an Irish diaspora predominantly working in English, while also reminding Irish people ‘at home’ that Irish is the ‘national tongue’. 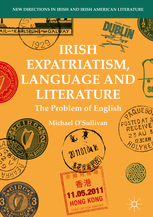 In returning to some of Ireland’s major expat writers and international diplomats, this book examines the economic reasons for their migration, the opportunities they gained by working abroad (sometimes for the British Empire), and their experiences of writing and governing in non-native English speaking communities such as China and Hong Kong. It argues that their concerns about belonging, loneliness, the desire to buy a place ‘back home’, and losing a language are shared by today’s generation of social network expatriates. Michael O’Sullivan is Associate Professor at the Chinese University of Hong Kong. He has worked for universities in Ireland, the UK, the US, Japan and Hong Kong. He has published widely in Irish Studies and in the humanities. Recent books include The Humanities and the Irish University and The Incarnation of Language: Joyce, Proust and a Philosophy of the Flesh.